The regular meeting of the Federal Open Market Committee (better known as the Fed) starts today and ends tomorrow with an official statement followed by a press conference. Markets expect the Fed to announce that interest rates will rise another 25 basis points, with 100-percent probability. Further, they are currently pricing in another couple of increases this year, as you can see in the Bloomberg chart below. 1) 25-basis-point hike. The most likely option, of course, is that the Fed will raise rates by the expected 25 basis points. If that happens, markets will be relieved. But the real question will be whether the Fed hints that rate increases will go faster, with perhaps four this year instead of three. Powell has two options in the statement and press conference. If he leaves the hikes at three, markets will interpret that to mean that Yellen has not in fact left the building. If he elects to push it to four hikes? That would be a clear signal that the new boss is not the same as the old one. 2) No rate increase. There are, of course, two other reasonably possible options here. The first is no rate increase at all. This would certainly rattle markets, in that they are pricing in 0-percent chance. This would signal that the Fed sees a great deal of risk and weakness in the economy, which could rapidly become a self-fulfilling prophecy. Given what the Fed has been saying about the economy, and the good news we have seen, I have to rate this as very unlikely. It really would be a shock. 3) 50-basis-point hike. Also unlikely, but somewhat more possible, is that Powell and the Fed decide to make a much stronger statement by raising rates 50 basis points instead of 25 basis points. You can see in the chart above that markets have an 18-percent chance of this priced in, but this would still be a big surprise. 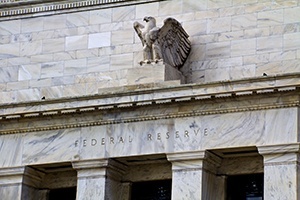 It would also suggest the Fed sees growth—and inflation—to be much stronger than is currently perceived. This really would rattle markets by raising the uncertainty around both the economy and monetary policy. As such, it is unlikely. But if Powell really wants to make a statement, this would be a very effective one.